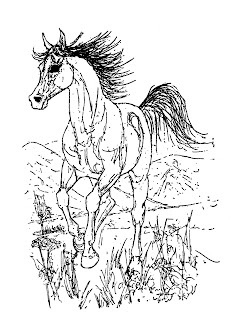 Sheila Rose is one of those classic pony book illustrators: her style is instantly recognisable: quite spare, and swiftly drawn, and she has the rare ability to draw both horses and people. Many pony book illustrators seem to fall at the fence of producing recognisable humanity, though there are those, like Geoffrey Whittam, who have the people alright, but seem to have a block when it comes to horses. Sheila Rose was born in Bishop’s Stortford on September 26th, 1929, and was educated at Hitchin Grammar School and Harrogate College. She started riding her own ponies, and drawing them, when she was four, and, according to her entry in Who’s Who in the Pony Magazine Annual 1968, “competed at all shows in Hertfordshire between 1940 and 1945.” Allowing for the fact it was wartime, when there were less shows than normal, that still shows formidable determination, especially as she also found time to hunt with the Puckeridge and South Herts. As you have probably realised by now, as a child, I was pony-obsessed. 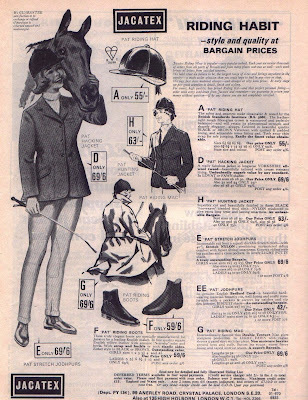 My favourite monthly reading was Pony Magazine, which I read cover to cover: every advert; every word. I recently bought a set of Pony Magazines from the 1960s. I actually took Pony in the 1970s, but there wasn’t a lot of difference between the decades in the style and contents of the magazine. I've been a bit absent lately, having gone down with another episode of my inner ear disorder, which means I am literally prostrate as I can't get up without falling down again. All this happened just as I was doing an interview on the Silver Bridle series with Caroline Akrill, getting my next catalogue ready, and dealing with a fox attack on the hens. We are, alas, four hens down. One died of shock in the night, and the other three are missing presumed eaten. I had hoped, as I had found no bantam feathers, that the bantams had survived, but unless they've found another home somewhere, I fear the worst. Three hens were completely unscathed, one had a few feathers missing, and poor Scrabbles was in a state, and needed nursing. Fortunately she is now on the mend, and has re-joined the rest. I am on the mend too, and the Caroline interview should be finished next week, barring anything else happening which I don't expect. Vogue's done it; The Times has done it (several times), and now they've done it again. Young women are embracing curves, they say. Turn the page of Times 2, though, and it's back to the model who looks, even though I'm sure she's eats ALL THE TIME and loves nothing better than a large Danish pastry and hot chocolate with whipped cream several times a day, as if she hasn't had a square meal in months. At last, here is some very long overdue information on Patricia Leitch: the only excuse I have for sitting on it for so long is my occasional tendency to let life descend into a muddle: I thought I’d muddled the letter Pat wrote me right out of existence, but a search for something else turned it up (as is so often the way, though not, of course, the other thing I was looking for. Still not the faintest idea where that is.) The other information came courtesy of Lorraine, who visits Pat in the Care Home where she now lives, and who kindly asked the questions on my behalf. I've had two of Bernadette Kelly's books for a while - the other is If Wishes Were Horses, which is the first in her Riding High series, for older readers. I'd put off reviewing them firstly because I am really, really slow at getting down the review pile, and secondly because they were only available in Australia, and therefore cost me a bomb to get over here, and was it, I thought, worth it? I'm not so sure about If Wishes Were Horses, about which more next week, but Naughty Norton is due to be published in the UK, albeit in a library binding, which does make it a bit more pricey. However, this is one series I'd buy like a shot if I still had children of the right age (ages 4 up as a to be read to, and 7 up for a read on your own).